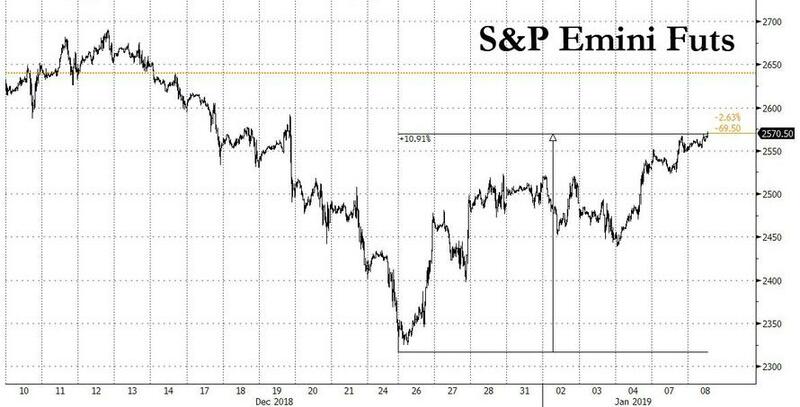 S&P futures, European equities and Asian stocks all jumped as investors awaited a positive outcome from trade talks between the US and China economies, ahead of a televised address by President Donald Trump in which he is expected to use emergency powers to announce the construction of a border wall, while the US government shutdown enters its 18th day. Chinese authorities plan to give a statement following the latest round of U.S. trade talks which ends today in Beijing, after both sides signaled progress toward resolving a conflict that has roiled markets, Bloomberg reported. "The talks are still underway and I believe we will release a detailed readout after they are concluded,” Chinese foreign ministry spokesman Lu Kang told reporters at a regular briefing Tuesday in Beijing. While no timing was given and it wasn’t immediately clear if the U.S. would release a statement, on Monday Commerce Secretary Wilbur Ross expressed optimism, telling CNBC that “there’s a very good chance that we’ll get a reasonable settlement.” This took place after China's Vice Premier Liu He made an unexpected appearance at the talks on Monday in a sign the Chinese were also pushing for a positive outcome. This was enough to push futures on the Dow, Nasdaq and S&P 500 to session highs, with the Dow pointing to a 200 point gain with the S&P over 20 points higher, and nearly 11% higher from the Christmas Eve plunge when Steven Mnuchin activated the Plunge Protection Team. 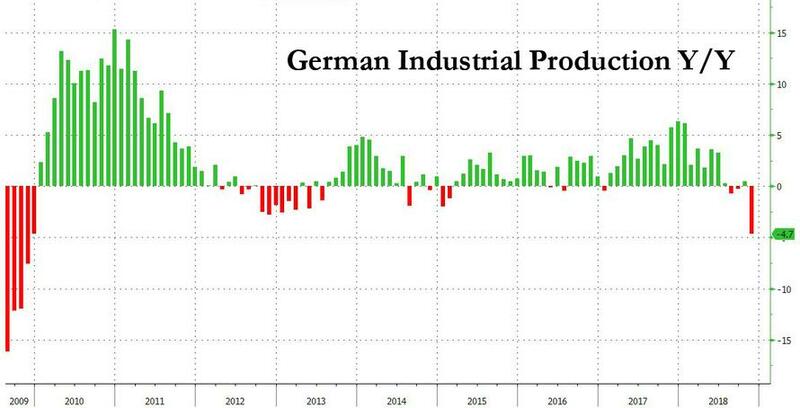 ... after shrugging off a shockingly weak German industrial production drop, the biggest since the financial crisis, and worsening euro-area consumer confidence to advance. Earlier, MSCI’s broadest index of Asia-Pacific shares ex-Japan reversed early gains however to end down 0.2%. 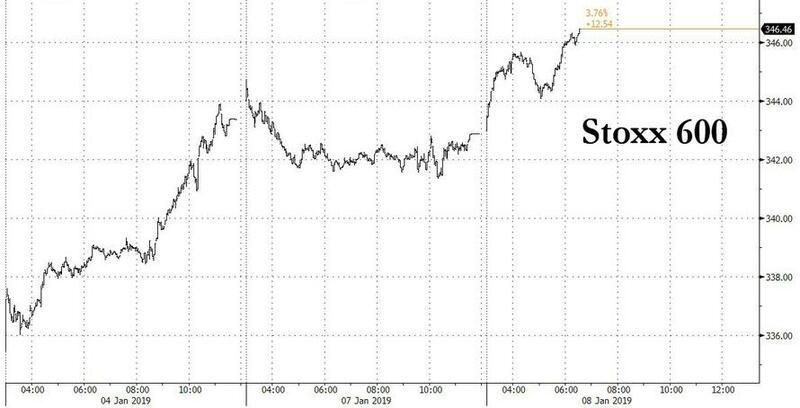 It was dragged lower by falls in South Korea due to Samsung and in China where government bond yields also saw their biggest daily gain in 9 months. Japanese shares and Hong Kong stocks closed higher, though equities slid in South Korea while China's Shanghai Composite closed closed down after flirting with gains and losses despite renewed promises of more easing by Beijing. Korean stocks were impacted after Samsung Electronics surprised the market on Tuesday with a 29% drop in quarterly profit, blaming weak chip demand in a rare commentary issued to “ease confusion” among investors already fretting about a global tech slowdown. The South Korean firm also said profit would remain subdued in the first quarter due to difficult conditions in memory chips, but that the market is likely to improve in the second half of the year as customers release new smartphones. Weaker earnings at the world’s biggest maker of smartphones and semiconductors adds to worries for investors already on edge after Apple last week took the rare move of cutting its quarterly sales forecast, citing poor iPhone sales in China. Dollar bulls got a breather as Treasuries steadied before a televised address by President Donald Trump, while the dollar gained for the first time in four days as investors dialed back some of the bets taken over the past week; rising stocks damped demand for the yen and short-covering in USD/JPY also bolstered the greenback. The euro retreated after touching 1.1485 as an unexpected fall in German industrial output for the third straight month helped to weaken the euro zone currency. The pound retreated after earlier touching a one-week high against the dollar amid supportive cross flows as traders assessed chances that the European Union will offer fresh assurances to U.K. PM Theresa May on the Irish border. Elsewhere, the Canadian dollar hit one-month highs, having gained 2.7 percent in the past five days on gains in oil prices and on speculation the Bank of Canada will raise interest rates again this week. It last stood at 1.3272 per U.S. dollar. Emerging-market currencies lost steam while oil extended its advance. Treasuries held steady and European bonds fell. Large short positions in bunds were covered through option trades amid another set of soft data out of the euro area that kept the euro offered. Stocks traded globally in the green, while euro-area bonds drifted lower. In the latest Brexit news, UK and EU leaders are reportedly in talks regarding possibly extending Article 50 past March 29th amid fears that a Brexit agreement will not be struck in time, according to the Telegraph. However, a UK Downing Street spokeswoman later stated that UK PM May has always said we would leave the EU on March 29th and that we would not extend Article 50. Instead, UK PM May is said to be pinning her hopes on a last-minute offer from Brussels to avoid her Brexit deal suffering a defeat at the House of Commons on the 15th January. Furthermore, UK PM will today be urged ‘play hardball’ with the EU by offering UK lawmakers a vote on her deal with the condition that they would be able to decide at a later date whether or not to enter the Irish backstop. In the latest geopolitical developments, we reported earlier that Turkish President Erdogan said that he cannot accept US National Security Advisor Bolton's comments on Syria, and that he has made a serious mistake, adding that he has agreement with US President Trump, but the administration are stating different things. Oil traded near $49 a barrel in New York, with Brent (+1.6%) and WTI (+1.5%) in the green, trading within a range of around USD 1.0/bbl as there have been no new major catalysts. Positive risk sentiment is predominantly fuelled on trade talk optimism between the US and China. The Iranian Deputy Foreign Minister says he hopes India will seek another US waiver on Iranian sanctions. Separately, the Arab Petroleum Corp expects oil prices to trade between USD 60-70/bbl by the middle of the year. Gold (-0.4%) is down as the dollar recovered lost ground overnight, alongside an improvement in risk sentiment as markets are optimistic that a deal can be reached between US and China. Separately, China have restarted their gold purchases following a two-year break; with 0.32M/oz of the yellow metal added to their reserves in December 2018. Canadian sources state that the US and Canada are not currently, or scheduled to begin, negotiating to lift metal tariffs; despite reports that discussions had been held on steel tariffs. Expected data include NFIB Small Business Optimism Index, while the publication of trade-balance figures has been postponed by government shutdown. Helen of Troy is among companies reporting earnings. Italy’s populist government has flagged its readiness to help cash-strapped Banca Carige SpA, approving state guarantees on any future bond issues and signaling its support for a possible precautionary recapitalization. Major European indices are in the green [Euro Stoxx 50 +0.9%] with gains generally broad-based. The FTSE 100 (+0.9%) is in the green with Ashtead Group (+3.7%) in the green after being upgraded at UBS and Tesco (+3.2%) in the green as their sales in the 12 weeks to December 30th increased +0.6% vs. Prev. -0.1% according to the Kantar update. Sectors are also in the green with some underperformance in energy and material names. Other notable movers include Morrisons (-3.4%) who are towards the bottom of the Stoxx 600 after Kantar data showed lower sales in the 12 weeks to December 30th of +0.1% vs. Prev. +0.5%; with the Co also reaffirming their 2018/19 targets. Unilever (-0.2%) are in the red after being downgraded at UBS. In FX, it was a choppy day for the dollar as the index recovered lost ground overnight and tested 96.000 (vs. intraday low 95.620) to the upside before pulling back to around 95.750 as markets await further details on US-Sino trade-related dialogue and US CPI later in the week. The dollar has re-gained traction in EU trade to retest the big figure ahead of US President Trump’s speech on the Southern border at 2100EST/0200GMT. GBP – A volatile day for the Pound as vague and contradicting Brexit reports emerge with initial upside in Sterling seen following comments from Irish PM Varadkar, who stated that the EU are willing to offer fresh written assurances on the backstop, ahead of House of Commons meaningful vote next week. Subsequently, Cable rose to levels just shy of 1.2800 shortly before retreating to around 1.2750 amid lack of clarity on the so-called assurances alongside the EU repeatedly stating that Brexit negotiations are not to be reopened and Brexiteers desiring an overhauled deal. GBP has been relatively indecisive overnight as Telegraph reports that UK and EU leaders are said to be in talks over extending Article 50 were shortly shot down by a Downing St. spokesman. Brexit Minister Barclay emerged during early EU trade to also deny the aforementioned Telegraph reports, whilst also adding that the process of the A50 extension is too complex. From a technical perspective, Cable resides just below its 50 DMA (1.2773) while options see 353mln expiring at 1.2770 at today’s NY cut. EUR – On the backfoot following a dollar-dominated Asia-Pac session as the single currency was slightly dented by the release of disappointing German industrial output which ING and Lloyds highlight increases the risk of a German recession. This saw EUR fall from levels just shy of 1.1450 to a low print of 1.1433. In terms of technicals, the pair’s 100 DMA lies at 1.1477 while a large 1bln in option expiries rests between 1.1425-35, potentially diluting some upside. AUD, NZD –The antipodeans are the marked G10 underperformers, also falling victim to the greenback, with the Aussie initially pressured upon the release of a narrower than expected trade surplus overnight. As EU trade went underway, the NZD and AUD lost more ground to the buck with the former retreating further below 0.7150 to lows in close proximity of its 50 HMA around 0.7120. Meanwhile the latter sits nearer to the bottom of a 0.6730-60 range with its 100 DMA around 0.6680. TRY- The Lira weakens for a second consecutive day amid comments from Turkish President Erdogan who rejected US National Security Advisor Bolton’s statement that the withdrawal of US troops from Syria depend on certain conditions, including Turkish assurances that the Kurds in Northern Syria would be safe. Given the possible repercussions on the relationship between Turkey and the States, USD/TRY rose past 5.4000 to a high print of 5.4767 (vs. low of 5.3800) ahead of the next psychological level at 5.5000. In commodities, Brent (+1.6%) and WTI (+1.5%) in the green, trading within a range of around USD 1.0/bbl as there have been no new major catalysts. Positive risk sentiment is predominantly fuelled on trade talk optimism between the US and China; where Chinese Vice Premier Liu He unexpectedly attending the talks, which were scheduled to be held at a vice-ministerial level. Elsewhere, the Iranian Deputy Foreign Minister says he hopes India will seek another US waiver on Iranian sanctions. Separately, the Arab Petroleum Corp expects oil prices to trade between USD 60-70/bbl by the middle of the year. Gold (-0.4%) is down as the dollar recovered lost ground overnight, alongside an improvement in risk sentiment as markets are optimistic that a deal can be reached between US and China. Separately, China have restarted their gold purchases following a two-year break; with 0.32M/oz of the yellow metal added to their reserves in December 2018. Canadian sources state that the US and Canada are not currently, or scheduled to begin, negotiating to lift metal tariffs; despite reports that discussions had been held on steel tariffs. Looking at the day ahead, we’ve got the November trade balance, JOLTS job openings and consumer credit prints. Away from all that US-China trade talks are expected to continue while the World Bank should release its latest global growth forecasts at some stage today. Compared to the relentless barrage of headlines in the last few sessions, the past 24 hours has either been dull or a welcome breather depending on your position. The good news though is that US equities made further headway on Friday’s employment report and Powell inspired gains yesterday. The S&P 500 closed up +0.70% last night, DOW +0.42% and NASDAQ an even more impressive +1.26%. To put a bit of context around the last couple of sessions, this has been the biggest two-day percentage jump for the S&P, excluding the outsized Boxing Day rally session, since August 2015.US HY spreads also rallied another 20bps in cash terms which puts the two-day move at an impressive -60bps, the best two-day stretch since June 2009. Amazingly the range for US HY spreads in the whole of H1 2018 was just 51bps. So we’ve easily eclipsed that in just a few sessions already. Treasury yields had actually nudged lower during the European session as risk stuttered a bit (eventually culminating with the STOXX 600 down -0.15%) however then weakened as the US walked in with 10y yields back up to 2.697% (+2.7bps on the day) and 2s10s curve slightly flatter at 15.1bps. WTI Oil climbed another +1.17% which certainly helped risk while the USD index (-0.53%) hit its lowest since last October. In all honesty, there wasn’t a huge amount to report. The US-China trade talks haven’t brought about any headlines of particular substance however are still ongoing so it’s worth seeing if anything comes out. Yesterday, US Commerce Secretary Ross said that there is a “very good chance” that a “reasonable” agreement would be reached but “the real issue is what are the enforcement mechanisms, what are the punishments if people don’t do what they were supposed to do?” On the talks, it didn’t go unnoticed that Chinese Vice Premier Liu He unexpectedly attended the discussions yesterday. It was previously expected that only mid-ranking officials would attend, so the inclusion of the top economic adviser to President Xi Jinping is significant insofar as China is attaching importance to the talks. Bloomberg reported yesterday that Liu is expected to meet with US Trade Representative Lighthizer later this month. Relatedly, our US economists cited trade as the number one uncertainty to the US economy and Fed outlook, which they updated yesterday (link here ). They modestly lowered their 2019 growth forecast by -0.1pp to 2.3%, though they maintain their existing inflation and unemployment projections. They now see a base case for two Fed hikes this year, as the Fed responds to tighter financial conditions with a slower hiking pace. If the US-China trade dispute resolves positively, they see scope for a third hike this year. If tariffs escalate further, they think a recession and rate cuts are possible. Continuing the Powell-induced trend toward a so-called “relent” and alongside our economists’ new projections, Atlanta Fed President Bostic talked down his rate expectations yesterday. He said that “right now, I’m at one move for 2019,” though he highlighted the possibility that he could support more or fewer hikes, depending on how trade policy develops and how the economy responds. Bostic is not a voter this year, but we’ll hear from voters Evans and Rosengren tomorrow and Bullard, Clarida, and Powell on Thursday. Perhaps equally important for risk sentiment will be President Trump’s planned address to the nation at 9pm ET tonight, where he will comment on the ongoing government shutdown. Midnight tonight is the unofficial deadline for a deal which would still enable furloughed federal employees to receive pay checks this Friday. So, barring a surprise breakthrough, the pain of the shutdown will begin to be felt soon. Meanwhile, and just in case you’d been missing them, Brexit headlines were back yesterday. However it wasn’t particularly exciting. Speaking to the British press, PM May mostly reiterated the points made over the weekend, specifically that before the debate begins again tomorrow, government will set out further assurances from the EU on the backstop and specific measures for Northern Ireland to alleviate the need for a backstop, as well as seek a greater role for parliament in negotiations on the future relationship. A vote next Tuesday is looking likely now. Yesterday DB’s Oliver Harvey published his latest update in which he reiterated his base case that May fails to secure ratification for the agreement in parliament next week. He attaches a 60% probability to May continuing with the current agreement and losing the vote (or delaying the vote again in the face of defeat) and a 40% chance of May pivoting to a softer Brexit stance and therefore gaining parliamentary support. He sees a 35% chance that article 50 is extended to accommodate more negotiations, new elections, or a second referendum, and a 10% chance of a “crash Brexit.” See this link for the full set of Oli’s further probabilities in the face of losing the vote next week. It’s been a busy day couple of days for DB research with our European equity strategist Sebastian Raedler arguing that current market conditions resemble the growth scare in late 2015 / early 2016. On both occasions, the rate of change in global PMIs turned sharply negative and markets priced significant further growth weakness on the back of China macro concerns and US recession worries. Back then, the worries were misplaced: PMIs rebounded, leading equities to rally by 20%+ and cyclical sectors to outperform sharply. He thinks the episode offers a good playbook for the current situation. His macro projections are consistent with 10% upside for European equities and 15% upside for cyclical versus defensives over the coming six months. See the link to the report here . 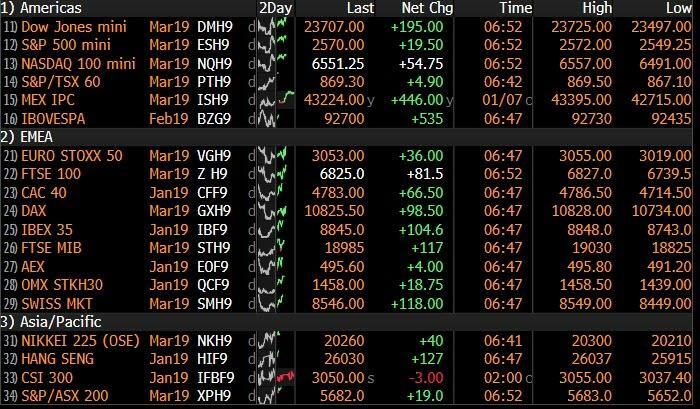 To markets in Asia now where sentiment is more mixed with the Nikkei (+1.49%) and Hang Seng (+0.35%) up fairly comfortably while the Shanghai Comp (-0.23%) and Kospi (-0.10%) are currently in the red. The declines in China and Korea appear to be partly impacted by a much weaker than expected earnings release from Samsung, which follows the latest downgraded guidance from Apple following weak demand in China. Elsewhere, futures on S&P 500 are up +0.47% in early trade today and most Asian currencies are trading weaker against the greenback this morning. In other news, yesterday’s data wasn’t much of a market mover. The non-manufacturing ISM for December in the US mirrored the manufacturing print in coming below expectations at 57.6 (vs. 58.5 expected and 60.7 previously). However, as it came out after Friday’s employment report it lost some of its usual impact especially with the most significant employment component reading coming in just over 2pts lower at 56.3 (which ironically would have likely heightened concerns ahead of payrolls). The associated text included the usual concern about tariffs that has become more commonplace, however the overall tone indicated further cyclical strength albeit there were some building concerns over labour shortages. Prior to this, in Europe the highlight of a quiet European calendar had been a softer than expected November factory orders report out of Germany. Orders came in at -1.0% mom (vs. -0.1% expected), albeit distorted by aircraft orders. Still, the year-on-year figure dipped to its lowest level since 2012 at -4.3%. Later in the morning we learned that investor confidence in the Euro Area wasn’t quite as bad as feared with the Sentix reading dropping to -1.5 in January from -0.3, compared to expectations for a drop to -2.0. Note also that DB’s Mark Wall lowered his 2019 euro area GDP forecast -0.2pp to 1.2% on the softer outlook for external demand. Full note available here .